Primo Lanterns GNB Universal Gooseneck Wall Bracket for All Primo Lanterns in Natural Gas or Electric Configurations Lantern Accessories from Primo Lanterns are designed and manufactured in Louisiana to exacting specifications, and add an additional touch of Southern Charm to their gorgeous line of gas and electric lanterns. 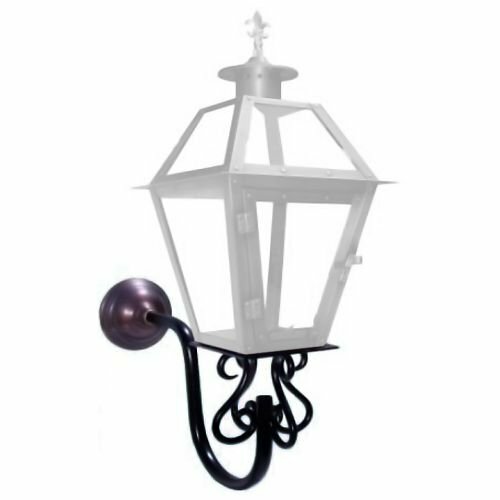 Primo Lanterns GNB Features: Fits all gas and electric lanterns except those listed below, which must be special ordered. Will not fit the following lanterns: PL-15 GL-35 GL-45 SL-35 SL-38 Pre-plumbed with copper tubing for gas installations Supplying decorative gas fixtures for over 32 years, Primo Lanterns, and the charming illumination of gas lanterns, is sweeping the nation. What started in the great cities of the Southern United States has now spread to all four corners of the globe, and Primo Lanterns is proud to bring that to you. Each Lantern is CSA Certified and its timeless design, based on classic gas lanterns found throughout Louisiana, is sure to add that "Southern Charm" to any home. If you have any questions about this product by Primo Lanterns, contact us by completing and submitting the form below. If you are looking for a specif part number, please include it with your message.